At VMworld 2012, at the vExpert briefing - we were introduced to an upcoming social idea that VMware were working on - Cloud Cred. Currently the site is not yet available (according to the mail above - it will be on March 11th) - as you can see from the screenshot below. 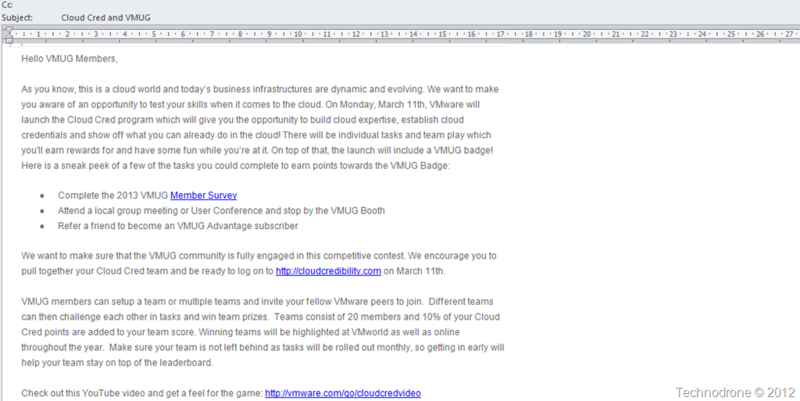 So what is Cloud Cred - I will leave this to VMware to explain..
An Overview and Demo is also available here. If I remember correctly the whole idea was not received very well at the briefing. Making the whole thing into a "game" where you are receiving points, and can get "stuff" for getting the highest scores and even "win" the grand prize of a trip for 2 to VMworld Barcelona - seems to diminish a good amount of what all the VMware evangelists, bloggers, vExperts do. We are not doing it for the points or trinkets, but because we believe in what we do. I think the commoditization of the blogging and evangelizing - will only reduce its value. Time will tell. PS. Thanks to Jake Robinson who pointed out that VMware just also launched their Cloud Credits program, which is not the same as the above. Cloud Credits and Cloud Credibility close but not the same. Why Can't We Just Talk to Each Other? And the Winner is…. You!